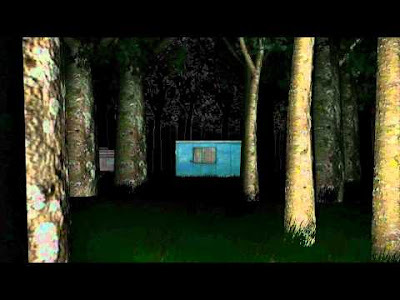 Slender is a short horror game really similar to Hide. You walk (or run) around in a monotone environment looking for notes, while there is a scary monster hunting you. Like Hide it is interesting to see how a simple setup can create a really spooky experience. The graphics are nothing special, the music is simple moody droning and the sound effects are of no great quality. Still, taking all together and put in an interactive space, it gets a lot more immersion than what you would expect. I think this is a great testament to the power of interaction to create a strong sense of presence in way that is much harder to accomplish in any other media. The game only lasts for few minutes, which is good because there is so little to do that any longer would most certainly break the spell. This makes me wonder what would have to be needed to make an experience like that last for one to two hours. Adding too much would likely decrease the sense of dread, so one would have to be careful in lengthening it. Hope someone attempts to do this. - The game hides the mechanics that govern how the monster hunts you down and what makes you eventually get killed. I think this was a good move as you are free to make up for yourself what happened. (Bound to only work on the first play-through though, but that does not have to be a bad thing). - A lot of the creepiness is induced through sensory deprivation. You mostly only see the same vague shapes over and over and it is not long until you start to imagine things. - It is interesting how effective the tunnel vision created by the flashlight is. There is just something about having these large chunks of your vision pitch black that make you unnerved. Recommend you all to give it a go!